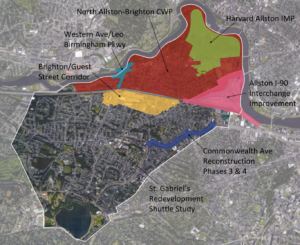 Boston is kicking off a project to identify potential improvements impacting all modes of mobility in the Allston and Brighton neighborhoods, and they want your help outlining the study’s scale. As a first step in that process, the Boston Planning & Development Agency will host a meeting on Wednesday, September 12, to provide a general overview of the Allston/Brighton Mobility Study and solicit feedback on what specifically the study should address. This is your opportunity to tell Boston where and how to improve biking in this growing neighborhood! Allston and Brighton have seen tremendous growth recently, with even more development either under construction of pending for the near future. So to mitigate the impact of all that new transportation demand, the AB Mobility Study aims to assess the area’s existing transit network and provide actionable goals and projects to improve conditions for all modes of travel. Building off Go Boston 2030 and other planning projects, the AB Mobility Study will result in immediate improvements while working toward a “menu” of suggestions for improving long-term accessibility, mobility and safety. The project is scheduled to conclude in Winter 2019/20. As the first public hearing on this project, this is your best chance to shape the project’s scope and focus. That’s why we encourage all of you to make your voices heard now so cyclists are adequately represented and their concerns are made clear at the outset of this potentially sprawling project. Stay informed — You can sign up here to receive updates from the city about this project. You can also use that same web form to submit feedback in writing. Allston has one of the highest ridership rates in Boston, with more than 5% of all residents saying they commute by bike. Franklin St also showed the highest amount of bikes as a percentage of total vehicles anywhere in the City at 43%! It’s why Boston’s 2013 Bike Network Plan envisioned a series of protected and unprotected bike lanes crisscrossing the neighborhood by 2018. Yet today, only a short segment of that proposed network exists. Tell Boston to expedite plans to build out more miles of that bike network so it truly protects cyclists and meets current and future demand!